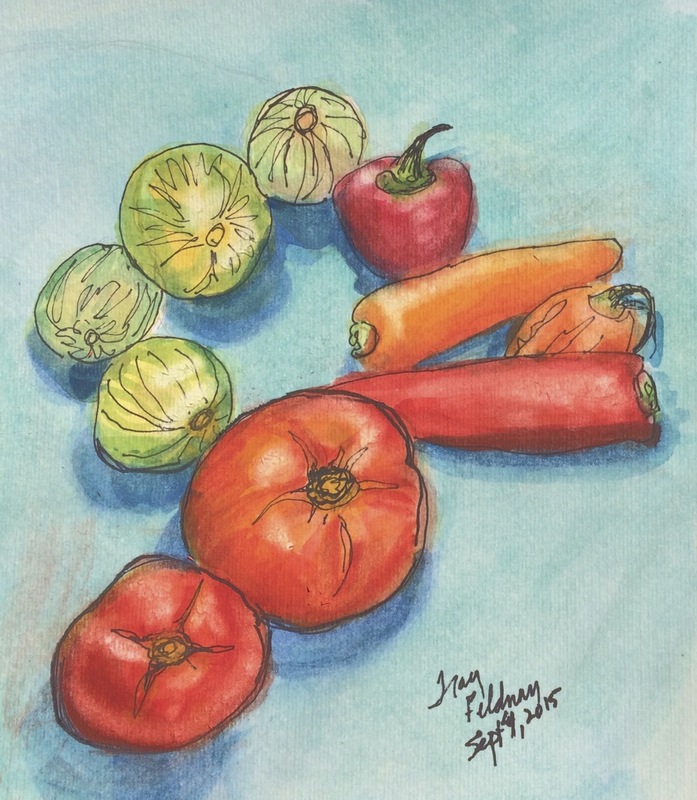 tracyfeldmanartblog: Yum ... Late Summer Veggies! I'm in a watercolor sketching group, and I have not been contributing much to it for much of the summer. Today, I went to our local Amish farm stand, and found these beautiful peppers and tomatoes. I particularly love the look of the heirloom ones. They remind me of gigantic gooseberries. I placed them on blue-green placemats I have because I knew the color contrast would make the veggies pop. I used ultramarine blue for the shadows, and love the water-like impression it creates. It is so neat living so close to where this food is grown. And, it is neat to have gotten to know the family who run the farm and the stand. Our sales girl today is a favorite of ours. We've know her since she was 11, and she is smart as a whip. She not only can easily do calculations in her head (a dying art since the advent of calculators), but she's feisty and a natural saleswoman. Living in an academic family for so long, part of me aches to think she's already left school: she had to or be shunned for getting too much education. But, she seems happy, so recovery has helped me realize that she can be quite happy living a life with her family and in her community. I haven't put an unmatted watercolor on paper up for auction in my DailyPaintworks gallery for a long time, so I'm going to do that with this small piece; and I'm going to make the starting bid a real bargain: $10. If you are interested in it, check it out.